Palmerston was a late frigate ship with three masts and a teak hull with specifications: Official #25236, Commercial Code Signal P.F.D.K., 978 tons, length 154.6 ft., breadth 30.6 ft., depth 22.3 ft., with a draft of 16.0 ft.
Palmerston was built in Moulmein, Burma in 1853, which suggests she was built by Duncan Dunbar II. Dunbar’s vessels were of teak cut from the forests that lined the banks of the river surrounding his Moulmein yard. His large mid-19th century fleet was mainly utilised as convict and immigrant transports and troopships in the Crimean War. The ship’s owner at the time of the 1860/61 voyage was H H Toulmin of London. 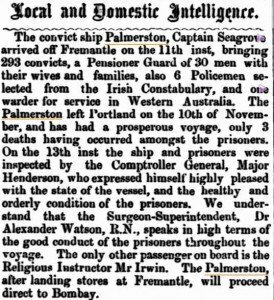 Palmerston left Portland on November 10, 1860 bound for the Swan River Colony and arrived in Fremantle on February 11, 1861 after a passage of 93 days. 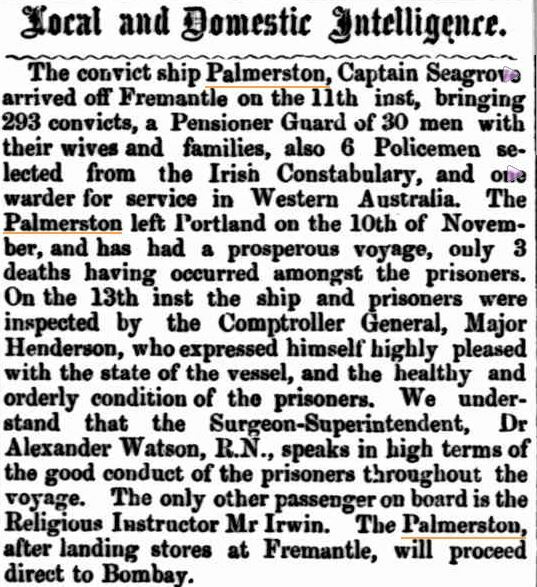 Three of the 296 convicts who had embarked died on the voyage. Sixteen convicts were former British Army soldiers who had been court martialled on various charges and sentenced to transportation. To date I have identified only five who served in the Crimean War, but this research is a work in progress. Another Crimean Veteran on board, Henry Benjamin Haynes, 9th Regiment, was convicted of the murder of a prostitute and at the age of 23 received a life sentence; he would ultimately be hanged in Perth for the murder of his wife. Captain J N Seagrove commanded a crew of 38. Dr A Watson and Rev William Irwin were the surgeon superintendent and religious instructor respectively. Also on board were 30 men of the enrolled pensioner force, their 20 wives and 49 children. As well as the convicts mentioned, 12 military pensioners were on board including two Warders, William Staples (Turkish Contingent) and Thomas Pickering. Other passengers of interest were six policemen from the Irish Constabulary [see note below]. 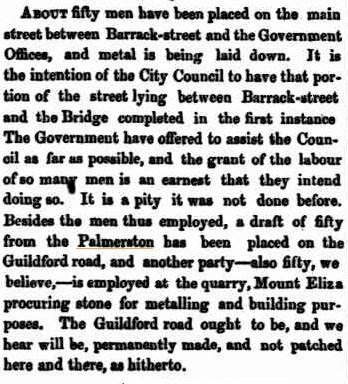 Passengers from Palmerston undertake Public Works. 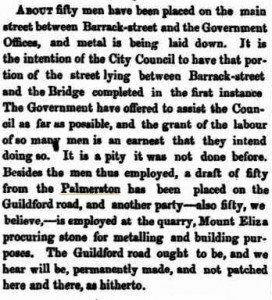 Inquirer & Commercial News 27 Feb 1861. The surgeon’s journal for the voyage did not survive. However, religious instructor William Irwin wrote an account of the voyage which is available on microfilm in the Australian National Library, Canberra and the Battye Library, Perth. Note: While in Ireland during his time as WA Police Chief in 1859, Sir Alexander Cockburn-Campbell recruited the six men on Palmerston for service in the WA Police Force: Patrick Cleary, James Gilchrist, Philip Furlong, Joseph Noone, Denis Roache and Patrick Sweeney. All of them are referenced in Molly Bentley’s ‘Grandfather was a Policeman’, Hesperian Press 1993. Convict Transportation Register HO11-18-179/180, National Archives Kew.